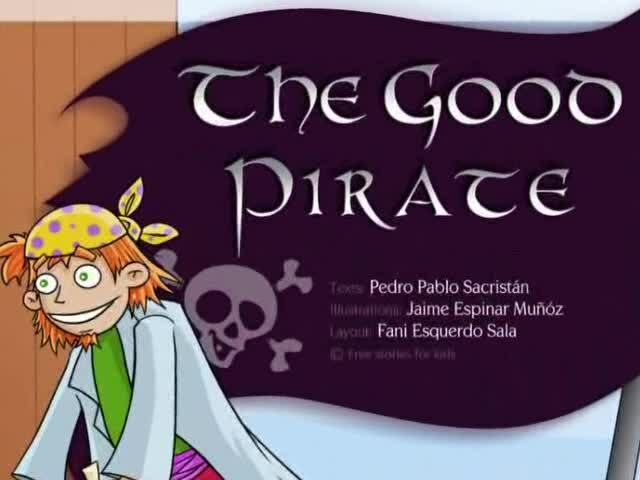 The Good Pirate. Short animated story narrated in American English. Not only was Longhands a young pirate boy, he was also the son of a pirate, the grandson of a pirate, and the great grandson of a pirate. Actually, he hadn't yet stolen anything, nor attacked any ship; but his whole family were sure that he'd turn out to be a first class pirate. Even so, the idea of spending his life robbing people certainly didn't appeal to young Longhands. He knew this because when he was a toddler, one of his cousins had pinched one of his favourite toys, which made Longhands really suffer. While he was growing up, Longhands' good nature meant that he worried terribly that some day his real pirate personality would suddenly emerge, and send him down the path of robbing, raiding, and pillaging. Every morning, when he woke up, he looked in the mirror to see if the horrible transformation had yet occurred. But every morning he had the same pleasant sort of face he had had the day before. As time went on, it became obvious to everyone that Longhands wasn't a pirate; but the family tradition was so long and so wonderfully infamous that no one was bold enough to come out and say it. "It's just that he's a good pirate," they would say. And they would have kept saying it even if Longhands had studied medicine and dedicated his life to caring for the sick. However, Longhands was still worried about turning into a pirate, and he continued consulting the mirror each morning. One day, though, seeing that he was now an old man, and having seen his children and grandchildren - none of whom had become pirates - he realised that neither himself, nor anyone, was ever forced to be a pirate, whether from natural forces or from duty. Everyone could do whatever they chose with their lives! And, having chosen his own life and his own path, Longhands felt deeply happy that he never chose to be a pirate.